As soon as I opened Real Food for Babies and Toddlers, I grabbed my sticky labels and started marking recipes. There are so many delectable-looking wholesome meals in this recipe book, and the layout, instructions and notes will make your cooking experience fun and easy. The book starts with a comprehensive look at what good food is and why it is important for growing kids. Author and nutritionist Vanessa Clarkson provides detailed information on the foundations of nourishing food, how children grow, when infants should move from milk to solids and how to actually make the move. After the detailed introduction, there are more than 80 exciting meals to try, like fragrant chicken broth, red capsicum pasta bake and coconut crumble bars. You’ll find ideas for breakfast, lunch, dinner, snacks and dessert, all using a wide variety of healthy ingredients, from quinoa to kale. Divided by seasons, the recipes are easy to follow, and there are loads of tips and tricks for tailoring the meals for very young infants or making them allergy friendly. And these aren’t recipes designed for babies and toddlers alone. Everyone in the family will enjoy them, so there’s no reason to make separate meals. At the back of the book you’ll find a comprehensive index, and I loved the Nutrition Information and Recipe List. This list is divided by dietary requirements and includes all the recipes (and recipes that can be altered) for a variety of diets, including vegetarian, vegan, dairy-free, gluten-free, nut-free and more. The focus of the book is on baby-led weaning and everything you need to know to start the baby-led weaning experience. But even if you’re not going down that path, the recipes can be saved for when you are ready to start introducing solid foods. 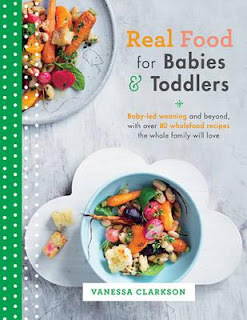 Real Food for Babies and Toddlers is a comprehensive information and recipe book filled with fun and healthy recipes for the whole family.